Photos courtesy of Alice Rogalski. The Alices and kids with Sweet Potat0es 2016. A shocking statistic led to the “I Can Shine Garden” at Tancil Court in Alexandria, where Master Gardeners have been coaching children since 2010. A 2007 study of obesity in Northern Virginia found 43.5 percent of the children in Alexandria between the ages of 2 and 5 were overweight or obese. The city applied for and received a federal grant to launch a multi-pronged effort to fight obesity. 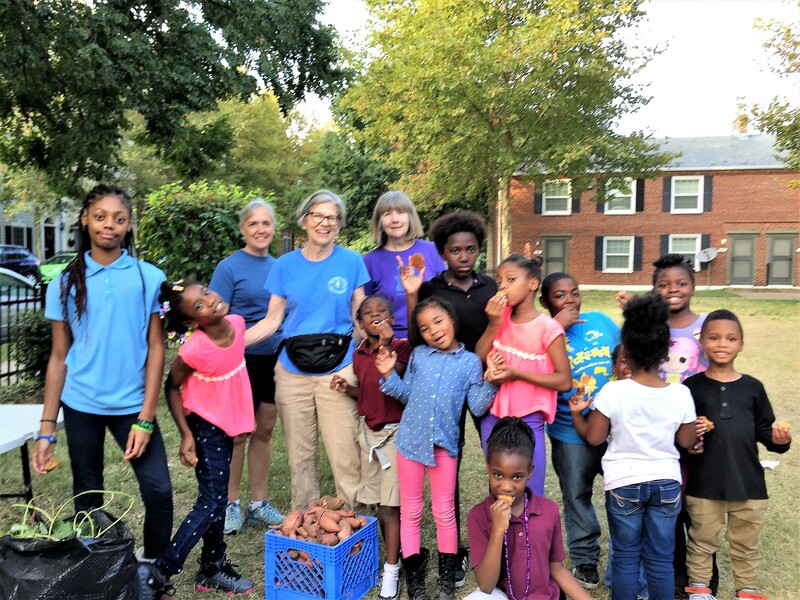 The Alexandria Redevelopment and Housing Authority set up community gardens for adults in public housing projects and a chef taught classes in how to cook healthy dishes. In 2010, the city worked with Master Gardeners to create the children’s garden at Tancil Court adjacent to the Ruby Tucker Center, which provides after-school programming and other family services to the residents in the surrounding area. The idea was for kids to be more active outside and learn about healthy food choices while having fun. There were even T-shirts. The federal assistance and the T-shirts are long gone, but preschoolers through fourth graders at the public housing project still learn through gardening that vegetables start life from seeds — not in cans, boxes or encased in plastic. Coached by Master Gardeners, the children still learn how to plant, cultivate, harvest and use vegetables, fruits and herbs in healthy snacks. “They love to dig,” said Alice Reid, a Master Gardener and co-coordinator with Master Gardener Alice Rogalski. The Alices lead the Thursday afternoon programs that draw anywhere from half a dozen to 20 children. The program is supported by Center Director Gaynelle Diaz and her staff. About a dozen Master Gardeners and other community volunteers who find the program through local volunteer bureaus, such as Volunteer Alexandria and Volunteer Match, take turns gathering weekly from March through September or October. “It’s tutoring while getting your hands dirty,” said Alice Reid. The heart of the garden is a 19-foot by 4 ½-foot plot. Gardens have a way of expanding, of course, and over time an adjacent 6-foot by 4-foot raised bed was drafted for cucumbers. Two 10-foot-square tree wells that had lost their trees were deployed for watermelons and sweet potatoes. Yukon gold and red potatoes grow in bushel baskets and herbs thrive in pots. The children love being outside after a day cooped up at school, love putting their hands in the dirt, love the attention from the grown-ups—and did someone say snacks? The Master Gardeners plan the snacks to connect with the produce they’ve planted or have grown. When it’s time to plant sweet potatoes, volunteers bake sweet potato pies at home as that day’s snack to share—for a sweet lesson in patience. Months later, after the fall harvest, the children take a few of the sweet potatoes home, but the volunteers cook, peel, mash, and freeze most of them and later they get made into pies for the Harvest Festival. For a lesson on herbs, the children are offered crackers or bagels with plain cream cheese and with cream cheese mixed with garden-grown basil and parsley. No contest! For tomato tasting, grocery store tomatoes vs. garden-grown. Again, no contest! The children make salads from the greens, and sweet pickles from the cucumbers. Treats include zucchini bread and sweet potato muffins, and fresh vegetables with ever-popular ranch dressing. When the weather gets warmer, snack will often be watermelon slices, and when the children get to harvest the melons from the garden they eat those also, as well as have a seed-spitting contest. Last year, there weren’t enough bees to pollinate the squash and the tomatillos, so came a lesson in coping with disappointment. “I don’t think we have changed anyone’s eating habits. That would take more than a few vegetables once a week,” said Alice Reid. But the children have learned to try new foods and that healthy food can make good snacks. And along with the nutrition lessons, and how to plant, water, and care for the garden, the children also observe and record the weather, weigh their crops, and learn some basics of how plants use soil, sun, and water to grow. Older kids help younger ones. Everyone learns the joys of working in the soil – it’s not just dirt!